The Burris Laboratory School digital collection provides online access to archival materials documenting the history and development of the Burris Laboratory School in Muncie, IN, highlighting the student experience at Burris from the 1930s to the 1980s. Click the image to browse the collection. The Burris Laboratory School, a Kindergarten through 12th grade experimental school on the campus of Ball State University, opened in 1929. Named after Benjamin Burris, college president from 1924 to his death in 1927, the institution provides high-quality elementary and secondary education while allowing students of Ball State University to gain practical experience educating pupils. Included in the collection are Burris High School commencement programs, Burris campus newsletters, and Burris student newspapers. Newsletters available include editions from the Burris Banner, Burris Briefs, and Burris Daily. Digitized student newspapers available in this collection include editions from the Burris Owl from 1930 to 1966 and editions of the Burris Vanguard from 1972 to 1987. Also available are a selection of scrapbooks documenting Burris basketball in the 1930s and 1940s, scrapbooks documenting general student life, a selection of theatre programs from Burris drama productions, and documents compiled from the "Save Burris" campaign in reaction to the uncertain future of the school in the early 1980s. 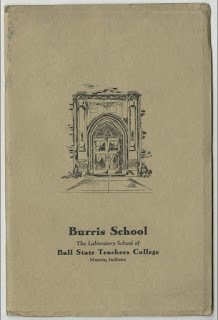 A history entitled The Fifty Year History of Burris School written by Robert C. Rose in 1981 is available in print in Bracken Library on the campus of Ball State University. Digitized photographs documenting the history of the Burris Laboratory School are also available online in the Ball State University Campus Photographs and Muncie and Delaware County Historic Photographs collections in the Digital Media Repository.